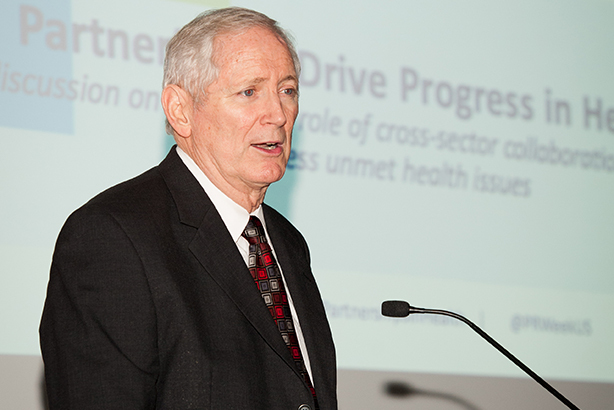 During his keynote prior to the Kyne-hosted panel discussion, CDC Foundation president and CEO Charles Stokes outlined how public-private healthcare partnerships have evolved and the lessons he has learned to make such unions work most effectively. Societal issues, what we in public health call population-based health issues, must be owned by all of us. They affect all of us. Partnerships are essential in solving societal issues. True partnerships start in the middle, which is one of the many things I have learned since the CDC Foundation was started 20 years ago. What excited me most upon taking the role was the belief everyone would immediately want to partner with the CDC. For the first five years, I only began to understand the challenge I had accepted. I'd get comments such as "We’re so glad you’re still around" or "We’re surprised the foundation is still around." Such feedback truly underscored the common understanding that partnerships were really difficult, particularly as we were building one between a federal government agency and the private sector. That just hadn’t been done much before. I recall working on one with Cargill. The CDC's nutrition head invited company leaders to Atlanta to learn more about what it did. I was asked to talk about the partnerships we'd built. Three of Cargill's executives took me aside and said, "So you have actually built a public-private partnership or two? We hear this talked about by government all the time, but we’ve not seen it happen." We ended up creating a fantastic million-dollar-plus partnership with Cargill, but the lead-up to it was full of signs that it’s an easy thing to talk about, but certain ingredients are necessary for success. The foundation’s goal was to build these partnerships on behalf of the CDC in a way that brought resources and expertise to the organization that would not compromise its ability to do its work. It was really the brainchild of public health pioneer Dr. Bill Foege, a true visionary who ran the CDC for many years. "The CDC should not be working alone," he’d say. "It needs partners from the private sector to do what it needs to do and do it well." He pushed and pushed. Eventually, in the early 1990s, the CDC went to Congress and introduced legislation to create this foundation. We wanted congressional approval and a blessing of this idea of public-private partnering. To date, we have created almost half-a-billion dollars in public-private partnerships for 720-plus programs in more than 73 countries around the world. It wasn't easy getting to this point. And among the first lessons I learned was that when seeking funding, we couldn’t start at the CDC. We needed to start with the problem. That’s what I meant by starting in the middle. The CDC looks at the world from 10,000 feet. It looks at data to understand what’s killing the most people and then converts that into a problem that needs to be better understood and solved. So we moved to the middle in our partnership development and started to bring prospective donors to the table. We began with major philanthropies. We just started having conversations about a problem. We invited people to the table who we knew shared an interest in a particular problem. Those discussions led to partnerships and we had congressional-governed authority as middlemen to accept dollars. And we could spend that money inside or outside the CDC. We had maximum flexibility to do what was best for the situation. We could also contract individuals to add to the CDC's capacity to tackle a problem. Philanthropic organizations interested in global health issues were an immediate match for us. For-profit businesses began to enter the equation later, but it took time to truly understand why a particular population-based health crisis was of enough interest to such an entity to make them good partners. It helped that we had become better at identifying the right people at these businesses who really had an interest and connecting them with the right folks at the CDC. As those conversations took place, we took extra care to be transparent and to ensure the proper protections were in place and that science reigned supreme. For example, the CDC has an entire unit devoted to institutionally acquired infections. People undergoing any drug-infusion therapy can become victims of unintended infections caused by low white blood cell counts. Basically, one out of ten people receiving cancer therapy ended up with infections that hospitalized them. Moreover, every two hours somebody was dying from one of those infections. This was a problem that needed solving. Amgen makes a cancer drug that has helped treat millions around the world. However, even some patients receiving their drugs were dying from infections caused by low white blood cell counts during chemotherapy. They immediately sought to partner with the CDC on an education campaign. It wouldn't be branded. No products would be discussed. It was all centered on a common interest - having fewer people die from these kinds of infections. Amgen funded an educational campaign. It created a website and training materials for physicians, patients, and families. It greatly increased the level of knowledge, reduced the number of associated infections, and it’s turned out to be a great partnership for all involved. We talk about the foundation being joined at the hip with the CDC, but still at arm's length. What does that mean? Everything we do is led by the CDC, but we have built an independent board of directors with high-level executives from for-profit companies, former executives of top global philanthropies, and world-renowned public health experts such as Dr. David Satcher, who was the CDC's director and surgeon general at one time. This is crucial because donors want to know we have their interests at heart as much as we do the CDC's. We are not there just to raise money for the CDC. Administrations change. Focuses change. But if the CDC, a donor, and the foundation agree on a project, it’s our job to represent the donor, too, and make sure that what was committed to happens. Of course there have been challenges. The CDC's core budget for its most important work has been cut by 15% over the last eight years. There are still so many people who question the validity of public-private partnerships. So we have to educate the public, the press, policymakers, the businesses we work with, even some philanthropic entities. We do that by talking openly and being fully transparent about the partnerships we build. Dr. Foege spoke often about several factors that are crucial to partnerships. The first is optimism. You must believe you can make it work regardless of obstacles. The second is communication. It is impossible to over-communicate in any kind of partnership, particularly a public-private one. There will always be friction and communication is the best tool to dissipate it. The third is trust, which is so closely tied to communication. I would add that you must demand clarity of mission and that everyone involved in the partnership has a similar vision of what success looks like. Additionally, there needs to be effective governance. Who’s running the show? How are we making decisions? Constantly focus on the outcomes and have those be the guiding forces. You also need a growth strategy, but a realistic one. Taken a step further, you need an exit strategy. Not every partnership works. When thinking about the future of public-private partnerships, the first thing to keep in mind is that disease has no boundaries. Take Ebola, which went from an outbreak to an epidemic, exponentially increasing. The need to be flexible on the ground became paramount. We've also discovered that in some cases partnerships need to be turned into coalitions. It's less bilateral. It’s more about bringing all these different types of organizations to the table so that the product isn't only the right one, but there's buy-in on all fronts. Lastly, speed and flexibility are becoming increasingly important. Time is of the essence. Solving problems can’t wait and they shouldn't have to with the connectivity we have today. Our foundation tries to fill the gaps that arise as things change so rapidly on the ground. To that end, it's been so rewarding to see partners step up and give us flexible money, such as the $25 million gift we received from Mark Zuckerberg and Priscilla Chan for our efforts against Ebola. We're not going the normal route of writing a grant. We're asking partners to trust that the people on the ground know how to best spend the money to get in front of an epidemic. It’s a smaller, flatter world. Population-based, public health problems belong to everyone. Ebola erupted in West Africa and now it's in our own backyard. Diseases are a plane ride away. We have to fix these problems together and public-private partnerships are one of the best ways to do that.